I was doing some family research at the archives in Trenton in January 2005 when I stumbled across something that only adds a greater mystery to the so-called forgotten children of Louisa and Ciro. Years ago, Dad and Uncle Larry told me that they had two brothers who were born on the farm in Morganville, after the family moved there from Brooklyn in 1914. Both died when they were very young: one on Christmas from injuries sustained after falling over in his highchair, and the other from a disease called "summer complaint". 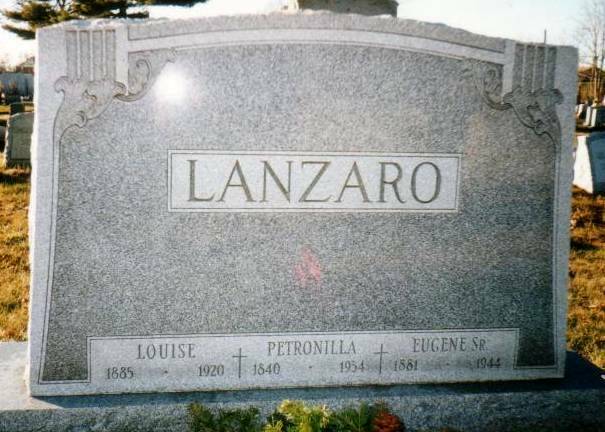 At St. Joseph's Cemetery in Keyport, there is a headstone that marks the graves of Louisa (Louise), Ciro (aka Eugene) and Ciro's mother, Petronilla. Carved on the other side of this headstone are the names 'FRANK' and 'SALVATORE'. I have always assumed that these are the two brothers that Dad and Uncle Larry told me about; that Frank died from Summer Complaint and Salvatore died after falling over in his highchair. But now I have evidence that there was another Salvatore, who was born and died between the first Salvatore and Frank. And as of April 2005, I know when and how Frank died. To put this in perspective, here's the complete story. Petronella - born December 13, 1903, in Brooklyn, exactly 11 weeks after Louisa and Ciro married on September 27, 1903. I have copies of her birth and death certificates. Apparently, she was named after Ciro's mother, Petronilla (although her name is spelled Petronella on the birth certificate). Unfortunately, she had a very short life. She died at the age of 15 months from bronchial pneumonia on January 28, 1905, just 2 days before the birth of the second child, Joseph. This must have been a particularly difficult time for the young mother, Louisa, who gave birth to her second child a day after burying her first. Louisa was just 20 years old at the time. On her death certificate, Petronella is identified as Patricia. We can only conjecture that Louisa may have accepted the traditional naming of her first daughter after the mother of her husband, but they obviously called her by the more modern sounding Patricia. She was buried in an unmarked grave at Holy Cross Cemetery in Brooklyn with her grandfather, Giuseppe Lanzara, who died in Brooklyn on September 20, 1901, at the age of 65. Joseph - born in Brooklyn, on January 30, 1905. Lawrence - born in Brooklyn, on December 21, 1906. Catello - born in Brooklyn, on June 17, 1908. Carmela – “Toots” is the only one of the siblings whose birth certificate I have not been able to locate. Her death certificate states she was born December 27, 1911, in Brooklyn. Eugene - born in Brooklyn, on February 7, 1913. 1914 - Ciro, Louisa, Petronilla, Joseph, Lawrence, Catello, Carmella, and Eugene move to the farmhouse in Morganville, New Jersey. Salvatore - born February 6, 1915, in the farmhouse in Morganville. I have his birth and death certificates. He was probably named after Ciro's brother who had died in Brooklyn one year before on February 13, 1914, at the age of 40. Twenty-two months after his birth, around December 18, 1916, little Salvatore fell over backward while sitting in a highchair built by Ciro. The baby hit his head on the floor. He lingered for a week before dying on Christmas morning, December 25, 1916. The official cause of death was listed as “cerebral spinal fever”. Ciro took the highchair and smashed it against the fireplace. Salvatore became the first resident of the family plot in Keyport. Salvatore - born March 19, 1917, in Morganville, 3 months after the other Salvatore died. I've only just discovered this Salvatore (January 2005). I have his birth and death certificates. Dad and Uncle Larry mentioned only one Salvatore. This one lasted less than 6 months. He died September 4, 1917, from Cholera Infantum, also called Summer Complaint: Common, non-contagious diarrhea of young children, occurring in summer or autumn. Symptoms are those of cholera. It was common among the poor and hand-fed (bottle-fed) babies. Death frequently occurred in three to five days. Probably due to food poisoning from spoiled milk as was most common in hot weather. Typically, after a meal was served at the farmhouse in Morganville, food was covered and set aside (left at room temperature) for the next meal. Refrigerators did not exist. There were only iceboxes. Infants and small children who had been recently weaned from the breast hadn't had time to build up an immune system, as had the adults and older children. If the child was started on solid food during the cooler parts of the year, the chances of ingesting spoiled food was less than in the hot summer months. In Salvatore’s case, the summer heat spoiled the food, his immune system was still too weak, and he became seriously ill. He suffered severe diarrhea and fever, and died within five days, on September 4, 1917. I believe this Salvatore is also buried in the plot in St. Joseph's Cemetery (it says so on his death certificate), but there is only one Salvatore on the headstone. Francis / Frank - born June 7, 1918, according to his birth certificate. They probably realized it was bad luck to name any more babies Salvatore, but this one may have been named after Ciro's uncle, Francesco, who died in Brooklyn at the age of 47 on January 6, 1892. Francis is listed with the family in Morganville on the 1920 Federal census as nearly 2-year-old Frank, and Louisa mentioned him in her letters before she died on July 16, 1920. After several years of searching, I finally located his death certificate. It shows he died at the Metropolitan Hospital in Manhattan, NY, on September 15, 1921, about a year after his mother. He was 3 years old. Cause of death was bronchial pneumonia. Ironically, Ciro and Louisa’s last child died from the same disease as their first. How did little Frankie get from the farm in Morganville to a hospital in New York City? His death certificate lists his residence as 941 Newkirk Avenue, in Brooklyn. This was the home of his grandmother, Amelia Leier, Louisa’s mother. Louisa contracted tuberculosis about a year after Frankie was born. She was sent to a TB clinic in Scotch Plains, NJ, where she stayed until her death over a year later. One can only conjecture that when it became obvious that Louisa was not returning home any time soon, the families decided it would be better for the baby to be with his 54-year-old grandmother in Brooklyn than on a farm in the “sticks”. Dad was 7 years old at the time, Toots was 8, Cat 12, Larry 13, Joe 15, Ciro 38, and Petronilla 76. Unfortunately, poor little Frankie would last only a year. The death certificate shows he was sick for two months before he died. 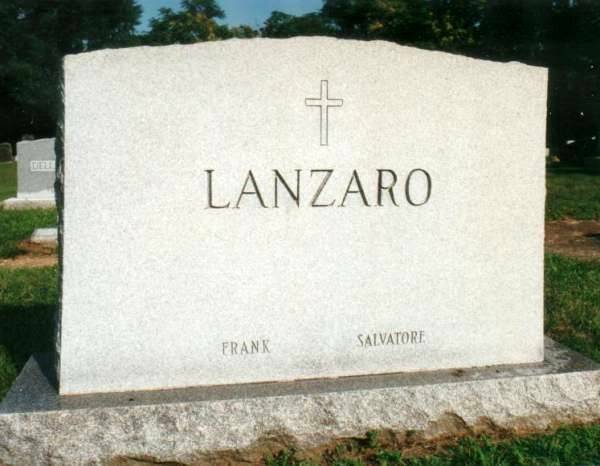 He was buried in St. Joseph’s Cemetery in Keyport with his two brothers Salvatore, and his mother. Petronilla would follow in 1934, and Ciro in 1944.